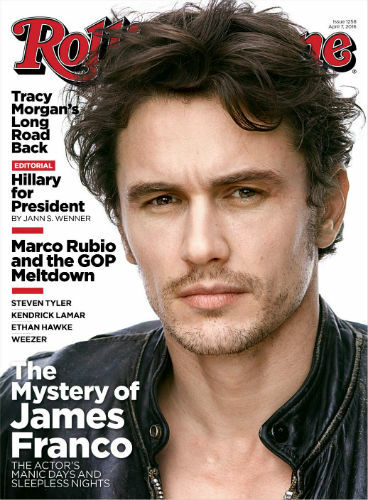 -According to Rolling Stone’s new cover story, James Franco is either the hardest working man in showbiz — or totally insane. Guess which one I’m betting on? –Channing Tatum and Jenna Dewan are making a dance competition show for NBC. I’d prefer it if was just a show consisting of them recreating their Step Up routine every week, but I’ll take what I can get. -Speaking of dance TV, someone is making a Center Stage TV movie and oh my god what is air?!? –Alan Cummings continues to confuse me by posting adorable BTS photos from The Good Wife set. -The Daily Mail’s interview with Tom Cruise and Nicole Kidman’s daughter and her new husband is very weird. –Justin Bieber is getting a lot of crap for cancelling meet and greets, but this seems totally reasonable to me. The only analogous situation I’ve seen is photo/autograph opps at a con, and I remember walking away from that experience thinking about how draining and difficult it must be for the celebrities. You’ve got people who paid a LOT of money to spend a total of 15 seconds with you, and there’s a lot of pressure to make those the best 15 seconds of their life. –George and Amal Clooney are pulling out the big guns for Hilary Clinton by hosting back-to-back fundraisers. -The reviews for Batman v Superman are in, and they’re pretty dismal. I knew we were in trouble when Drew at Hitfix slammed it, since he’s the only critic I follow who still stans for Man of Steel. Even the reviews marked fresh on Rotten Tomatoes don’t sound especially glowing. -Meanwhile, thanks to some very clever editing, Ben Affleck plays both Superman and Batman in a new fancut trailer. -Those assault charges against Orange Is the New Black’s Dascha Polanco have been dismissed. -This RuPaul interview is well worth your time, especially for the comments on why he’s never been on Ellen. –Jimmy Fallon played a perfect game of Catchphrase with delightful human beings Saoirse Ronan and Don Cheadle. -Game of Thrones isn’t giving critics advanced screeners this year, but President Obama might have an in. -The Love And Friendship trailer is hitting me right in the Austen-y feels. -I just watched the new trailer for Deepwater Horizon and I have so many questions. Was this movie sponsored by big oil? Did Mark Wahlberg say “how’s it going” exactly the same as SNL’s “say hi to your mother for me” on purpose? What’s my girl Gina Rodriguez doing in this? -Here’s the first trailer for Bridget Jones’ Baby. I dunno, guys. I just dunno.